The Thai Tiew Thai Travel Fair in the Queen Sirikit National Convention Center is back for a remarkable 44th time and Chatrium Hotels and Residences has some equally remarkable offers on superb stays and delicious dining available exclusively at the fair. From 31st August to 3rd September we’d love to see you at Booth No. P240 and P241 where you’ll have the opportunity to enjoy Chatrium’s brand motto of “Live the Remarkable” at a price that’ll put a smile on your face. Chatrium Hotels and Residences are to be found in the most desirable of locations so whether you’re looking to experience one of the world’s most vibrant cities in bustling Bangkok, take in the exotic Orient in fascinating Yangon or breathe in the crisp, fresh mountain air over a pleasurable game of golf in stunning Chanthaburi there’s bound to be a Chatrium property for you. The following very exclusive prices are only available to Thai citizens and local expats so what are you waiting for? Come on down to the 44th Thai Tiew Thai Travel Fair at the Queen Sirikit National Convention Center from 31st August to 3rd September and take advantage of our super special offers. In Bangkok true 5-star living is within your reach at Chatrium Hotel Riverside Bangkok with a stunning cityscape vista Grand Room City View for THB 3,500 net including complimentary buffet breakfast for 2 or a Grand Room River View for THB 3,900 net including complimentary buffet breakfast for 2 and a free upgrade to a Grand Suite One-Bedroom River View. We’ve also got the famous Chatrium Privilege Card available for only THB 3,500 per year with a host of special privileges not available to non-members. For a city center experience beyond compare at a price to match Chatrium Residence Sathon Bangkok has a comfortable Studio for THB 2,600 net with one-bedroom accommodation at THB 3,000 net including complimentary breakfast for 2 and discounts on food and beverages, laundry and dry cleaning and indulgent massages at the Green Leaf Spa. For iconic living in Bangkok’s most iconic address on top of the luxury Emporium Shopping Mall on Sukhumvit Road Emporium Suites by Chatrium offers a spacious Studio Deluxe for a mere THB 4,500 baht net including breakfast for 2 so you have the perfect base to shop ‘til you drop while just up the road in Maitria Hotel Sukhumvit 18 – A Chatrium Collection you’re guaranteed to “Stay Savvy” at the savvy price of THB 2,500 net for a Standard Room including daily breakfast for 2 and 3 free cans of soft drink. If a relaxing stay in the sheer tranquility of one of Thailand’s most beautiful provinces or a challenging game of golf is more to your liking Chatrium Golf Resort Soi Dao Chanthaburi has a fair-only price of THB 1,600 net on weekdays and THB 2,000 net on weekends for a Deluxe Room with private balcony including daily breakfast for 2, free bike hire and a free golf cart tour of the grounds and if you buy 10 you get 1 free while the international class golf course has green fees of THB 650 net on weekdays and THB 950 net on weekends with a buy 5 get 1 free deal. Opulent lakeside luxury is waiting for you in exotic Myanmar in the stunning environment of the city’s premier property Chatrium Hotel Royal Lake Yangon with a 2-night stay in a Deluxe Room City View including daily buffet breakfast for 2, complimentary round trip airport transfer, complimentary welcome drink, fruit and flowers and a full day city tour on your 2nd day at the unbeatable Thai Tiew Thai price of THB 6,500 for twin sharing. Chatrium properties are also renowned for the delightful dining options available in every hotel or residence and at the 44th Thai Tiew Thai we’ve got some really delicious food promotions as well. The award winning Silver Waves Chinese Restaurant high above the Chao Phraya River in Chatrium Hotel Riverside Bangkok has a delectable all you can eat homemade Dim Sum Lunch including tea for THB 720 net per person and if you purchase 5 vouchers you’ll receive an extra complimentary voucher, while Bangkok best themed dinner buffets at the River Barge Restaurant are only THB 1,100 net from Sunday to Thursday including free flow soft drinks with Friday and Saturday’ s Remarkable Weekend Dinner Buffet at THB 1,290 including free flow soft drinks. Albricias Restaurant in Chatrium Residence Sathon Bangkok would like to take you on a culinary world tour with an exclusive Thai Tiew Thai Come 2 Pay 1 promotion; THB 1,299 net per person for Tuesdays Japanese Buffet Dinner, THB 1,650 net for Fridays Seafood International Buffet Dinner and THB 1,050 net for Saturdays Mediterranean International Buffet Dinner. You can also enjoy a supremely sedate Dim Sum Lunch in the peace and quiet of the Emporia Restaurant in Emporium Suites by Chatrium for an attractive THB 650 net or a genteel Dim Sum Afternoon Delights experience for THB 500 net. So whether you’re looking for a superb stay which exceeds your every expectation or a memorable meal with your family or friends come and check out the exclusive offers at Chatrium Hotels and Residences, only available at the 44th Thai Tiew Thai Travel Fair in the Queen Sirikit National Convention Center. Visit us at Booth No. 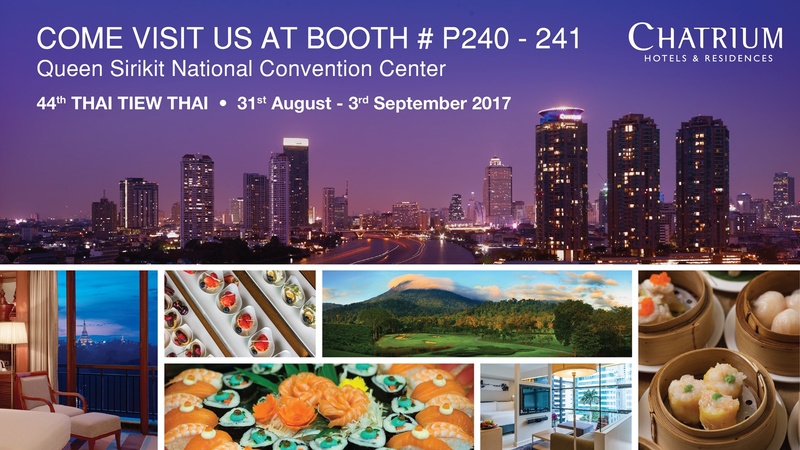 P240 and P241 at the 44th Thai Tiew Thai Travel Fair from 31st August – 3rd September 2017 in the Queen Sirikit National Convention Center. Next PostNext Chatrium Hotel Riverside Bangkok is Top Ranked!